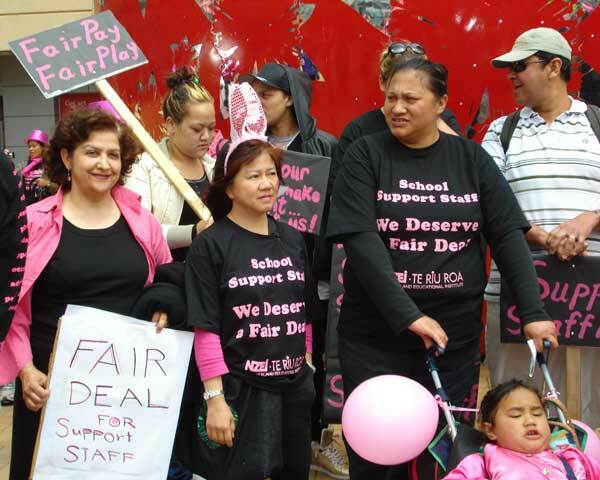 AUCKLAND, New ZealandZero percent wont pay the rent, and Fair deal, get real, chanted more than 1,000 school support workers as they marched through the central city here November 28. They were demanding the government lift its freeze on wage increases for public sector workers. These workers, predominately women, hold jobs as teacher aides, librarians, special needs support workers, school secretaries, and technicians. Thousands of hospital workers nationwide protested the pay freeze the day before, with a four-hour strike and rallies.